The UAEJJF crowned their first ever “King of Mats” champions in three weight classes on Tuesday, April 24 in Abu Dhabi. 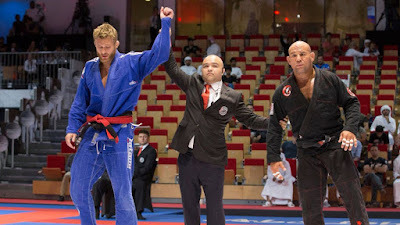 Three different divisions composed of former Wolrd Pro and Grand Slam champions battled it out at lightweight (69kg), middleweight (85kg) and heavyweight (110kg). The competitors would first meet in two round robin groups, and then finally with a four person single elimination bracket. The winner took home $30,000, second place $10,000 and third $5,000, with extra bonus money to be awarded on for best match and best submission. 2014 World Pro champion Saggioro went undefeated in group A to finish with the top spot from this group heading into the final bracket. Paiva defeated George, Lima and Canquerino but lost to Saggioro, finishing second and advancing. Three out of five athletes in this group finished with a 3-1 record, which resulted in Grippo winning the group while Vinicius finished third with a win over Grippo. The deciding factor between Marques and Celso would be Marques referee decision victory over Celso in their final match of the group. Gianni Grippo vs Isaque Paiva: Back and forth sweep battle between the two, with Grippo scoring last to take an 8-6 victory and advance to the final. Thiago Marques vs Leonardo Saggioro: Marques would score first in this semi, but Saggioro swept back to win 2-2 with 1 advantage. Gianni Grippo vs Leonardo Saggioro: Grippo pulled guard but wasn’t able to get much going. Saggioro spent the later part of the match pressuring with a double under pass, takes the unanimous decision and the $30,000 prize. All three athletes in group A went 1-1, with Canuto taking the top spot with a points win opposed to wins by advantage by Galvao and Negromonte. After beating Canuto 0-0 on advantages, Galvao would go down the same way to Negromonte shortly after. Canuto wins 2-0 with a foot sweep off a guard pull to take the group, Negromonte advances with the second spot. Renato Canuto went 2-0 with a forfeit by an injured Tarsis Humphreys to take the group, Along the way he defeated Satoshi on points and hit a beautiful armlock on Clark Gracie. Satoshi hit a triangle on Tarsis for the submission and defeated Clark to finish second. A last second omoplata advantage gave Clark the victory over Tarsis. Jaime Canuto vs Roberto Satoshi: Jaime was all over Satoshi with guard passing chains to come away with a 6-0 victory. Renato Canuto vs Charles Negromonte: Negromonte got Renato into his closed guard and controlled the match from there, eventually taking a referee decision victory, setting up a rematch with Jaime in the final. Jaime Canuto vs Charles Negromonte: Jaime looked to be in control for much of the match, Negromonte gets a late advantage for a near pass to take the 0-0 win at the buzzer. Canuto was spinning under for a leg lock when he ended up in a bad 50/50 with Charles leg on the wrong side, Negromonte would smash his way through to force the turtle and become King of Mats. Trans goes 2-0 with Rice going 1-1 to both advance. Jose lost both of his matches 0-0 on an advantage, while Trans beat Rice 2-0. Roberto “Cybrog” Abreu expectedly ran away with this group, winning all three matches to advance. Souza and Campos both went 2-1, with Souza winning the head to head matchup and getting the tie breaker. Alexander Trans vs Alexandre Souza: Quick rib injury off a trans takedown, Souza has to forfeit and Trans advances. Roberto Abreu vs Tanner Rice: Close battle with neither athlete able to get much going, Abreu nearly gets a throw at the end which most likely gave him the ref decision. Alexander Trans vs Roberto Abreu: Trans looked like a man on a mission in the final, and took Cyborgs back before finishing a collar choke to become the first ever heavyweight King of Mats.